UPDATE: Pre-program Internship will not be hosted in 2019, but will return for 2020. The UW Libraries offers one pre-program internship in conservation each year. Interns have the opportunity to develop their conservation treatment skills and portfolio using diverse special collections from the UW Libraries. Applicants are expected to have a demonstrated interest in conservation and to be preparing for or enrolled in a graduate level conservation program. This is a full-time (40 hours per week) summer program. Duration is 10 weeks. The position will be advertised in early winter on the ConsDistList and PADG listserves with applications due in February or March. For more information, read the full description. I had a wonderful experience interning at the Conservation Center this summer. The internship far exceeded my expectations in terms of scope and it was an absolute pleasure to work under the guidance and mentorship of Justin Johnson. In the ten weeks alone, I reconstructed a historic binding model and completed extensive treatments on nine leather-bound volumes, all of which strengthened my documentation and decision-making skills while providing ample opportunities for me to experience a diverse range of treatments and techniques. Another large part of my internship focused on the Chinese stele rubbing collection of the East Asia Library. Building upon my background in Chinese art history, I had the unique opportunity to identify a conservation treatment protocol for the collection using pre-coated repair materials. This undertaking culminated in a full written proposal complete with rehousing solutions, case study treatment results, and financial and labor projections. The project proved to be rigorous, but the chance to be part of the collaborative effort to promote the preservation of the rubbings collection was something truly special. I am incredibly thankful for the insights I have gained from this experience. Not only has my confidence grown, but I am more prepared to embrace the next chapter of my career. Alexa Machnik recently earned her BA with Honors in Art History and East Asian Studies from the University of Wisconsin-Madison. She previously held conservation-related positions at the University of Wisconsin Libraries and the Howard Gotlieb Archival Research Center in Boston, MA. 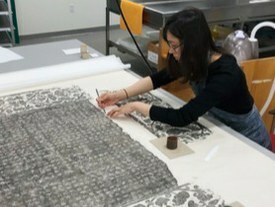 In addition, she completed a year-long internship at the Art Research Center at Ritsumeikan University in Kyoto, Japan, studying Asian paper conservation. Alexa is also interested in Sino-Japanese studies and pre-modern Japanese Buddhist art, topics she thoroughly investigated for her senior thesis work. She is continuing her training in the field of book conservation at the Center for Preservation and Conservation at Yale University Library. I have thoroughly enjoyed my ten weeks as an intern at the UW Libraries Conservation Center. My priorities were to increase my knowledge of leather binding treatments and complete more sophisticated photo documentation and treatment reports. This summer I have treated thirteen volumes, and a large foldout map. I learned new treatments, including leather rebacks and board-tacketing, and practiced my gold tooling skills. I was also introduced to the wonderful world of leather dyeing. My projects were focused on my main goal to work with leather, but also were varied enough to give me a wide range of treatment experience. I also worked with curators to develop treatment plans and completed detailed photo documentation and treatment reports. Justin Johnson was a wonderful instructor, and the other staff at the Conservation Center were a joy to work with. I am leaving with new skills and the confidence that I will be prepared for future graduate studies in book conservation. Christine Manwiller is from northwestern Wisconsin and received her B.A. with Honors in Art History with minors in Studio Art and Chemistry from the University of Wisconsin Eau Claire. She also completed the Certificate in Art Conservation program at the Lorenzo de Medici Institute in Florence, Italy. Christine is currently a third-year MFA candidate at the University of Iowa Center for the Book, studying Bookbinding and Letter Arts. 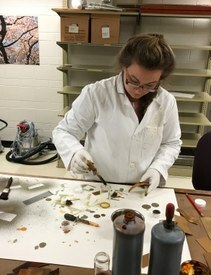 She is also working as a student lab technician at the University of Iowa Libraries Conservation Lab. Christine is also a calligrapher and book artist, her work has recently been featured in the national publication for calligraphy: Letter Arts Review. She has just finished her first completely hand calligraphed edition, a collection of poetry with eco printed illustrations. I am so grateful to have worked in the Conservation Center’s beautiful new space. My projects were tailored to the kinds of books I wanted to treat and my goals for progression by the end of the summer. In total I treated eight books and made two historical models, learning about different methods of board reattachment, leather rebacking, and limp vellum structures. In addition to treatment, I gained experience in working with a curator to develop a treatment plan and proper documentation. After this summer I have a much more well-rounded understanding of problems specific to the treatment of rare books, as well as feeling much more prepared to enter a graduate program for conservation in the future. Sara Belasco is from New York City, NY and earned a B.A. with Honors in Art History and a minor in Studio Art from Skidmore College. She has completed conservation internships at the Brooklyn Museum, Metropolitan Museum of Art, Morgan Library & Museum, and New-York Historical Society. Sara is currently taking additional chemistry and German classes in preparation for applying to graduate school this Fall and has returned to her internship at the American Museum of Natural History Library. I feel very fortunate to have worked as a conservation intern at the UW Libraries. During my ten weeks here, I was able to complete six full treatments and all of these items are now available for use by professors as teaching tools for their students. The projects selected for me were varied enough to expose me to a wide array of treatment methods while reinforcing the foundational skills I need in order to become a book conservator. I feel more confident entering my graduate program this fall with the experience that I have gained during this internship. I had not performed any treatments on antiquarian books bound in leather or vellum before this summer and I was happy to fill this gap in my knowledge. I even got to work on an illuminated manuscript! This was an invaluable opportunity for me. Michelle Smith is from Atlanta, Georgia and received a BFA from the Savannah College of Art and Design (printmaking major, book arts minor). She has completed conservation internships at several institutions including Emory University Libraries and the Georgia Archives. She has also interned with conservators in private practice. 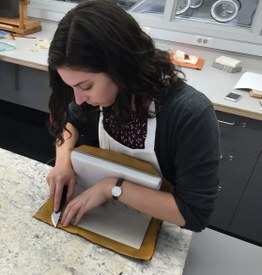 She will begin a graduate fellowship in art conservation at Buffalo State College in the fall of 2015, where she plans to concentrate on library/archives and book conservation. Michelle is also an avid book artist, printmaker, and quilter. As the University of Washington Libraries’ first summer Conservation Intern, I have been working on volumes from the Libraries’ Special Collections under the supervision of Senior Conservator, Justin Johnson. When tackling challenging projects, Justin’s mentorship has made it possible for me to feel confident in my decision-making process while still receiving his expert guidance. From the very beginning of my 10 week internship, I learned numerous repair methods and was able to put them directly into practice. The tools and materials available in the Conservation Lab made it possible to perform complex and delicate repairs to valuable items in the collection, like washing and rebinding entire books, or executing an archival spine repair that blends in seamlessly with the original material. In addition to the hands-on skills, I’ve learned about the important work of conservation away from the bench: consulting with curators and colleagues, photo documentation, and developing treatment proposals and reports. My knowledge base and hand skills have improved greatly due to the opportunity I have been granted at UW. Not only are the Suzzallo and Allen Libraries a beautiful place to work every day, but they have also proven to be a lively environment with an interesting and well-cared-for collection. I feel lucky to have been able to handle and repair everything from Gothic bindings to original Kelmscott Press books. Lizzie Curran is from Concord, Massachusetts and earned a B.A. in Studio Art from Bennington College and a diploma in Bookbinding from North Bennet Street School. 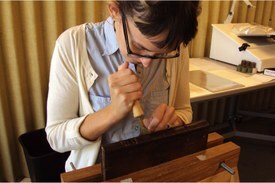 She has completed book conservation internships at Dartmouth College and the University of Washington. Lizzie has exhibited with and is a member of the New England chapter of the Guild of Book Workers. She currently is currently Assistant Conservator at Dartmouth College.